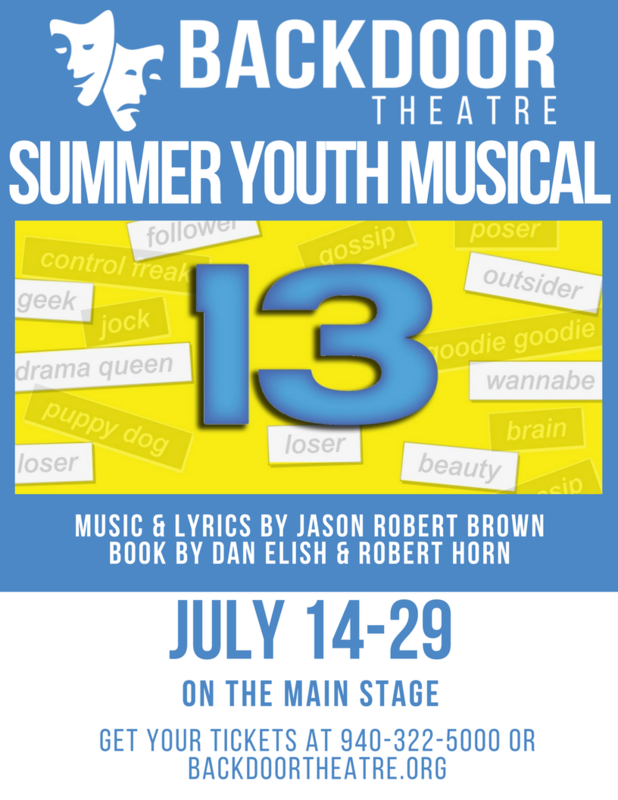 13 - The Musical follows the preteen Evan Goldman as he moves from the big city of New York to small town Indiana. He has a new school and new hometown, will he fit in and stand out or will he be left out? The first performances of Summer Youth Musical (SYM) were at Rider High School. When W. Erle White deeded the Icehouse over to Backdoor Theatre for its new home it was with the stipulation that the Summer Youth Musical always have a "home" at Backdoor Theatre. 2017 "13 the Musical" will be the 50th Summer Youth Musical. It includes youth ages usually 13-18 and in some cases 15-21 depending on current talent pool and audition turn outs over the years. Almost anyone who auditions gets to do something- such as acting, learning lights, directing, stage managing, costuming, music, and running the sound system. The last 4 Summer Youth Musical performances have been "Anything Goes", "Godspell", "Seussical" and "Bring It On"- others have been "Les Miserables" (youth version), "Back to the 80's", "Pirates of Penzance", Disney's "High School Musical".